Many documents that require translation contain sensitive information. However, the majority of translation companies falsely claim to be U.S. owned and operated. Frequently these companies operate from Eastern European and African countries where criminal activity is endemic. Despite the claims they make on their websites, these companies forego background screening and usually employ “crowdsourcing,” or outsourcing work to the lowest bidder. These part-time translators usually are not properly vetted; nor do they work on secured computers, instead working from public sites in Internet cafes. This results in low quality work. Identifying professional U.S. translation companies isn’t easy. 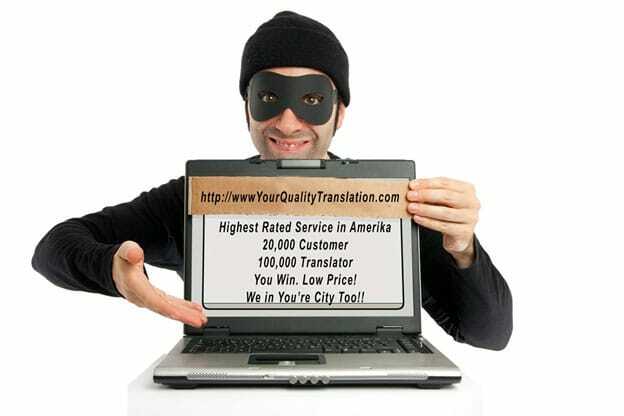 Many translation companies list local phone numbers, provide false domestic reviews and use phony addresses. In reality, they operate from overseas and have no U.S. employees nor U.S. offices. Their listed addresses are nothing more than rented mailboxes, and their phone numbers are routed to overseas operators. Calls to these agencies often go unanswered due to poor customer service and unreliable electrical and telecom networks. Signed non-disclosure agreements with these organizations offer no protection. 24 Hour Translation enjoys its reputation for exceptional service, on-time delivery and accurate translations through hard work and expertise. Our knowledge and experience, combined with our highly skilled translators, have earned us the competence to complete your project successfully. We invite you to demand and expect that your project be handled in an organized, timely, effective and cost-efficient manner. You can expect expert translation service in (1) professional and personal ranges and levels of services and (2) comprehensiveness of expertise. Our Houston translation services office serves a broad range of clients based in Houston, and beyond, including prominent Houston, law firms, Non-Government Organizations, non-profits, government offices, multinational and local companies, universities, financial and banking institutions. Our Houston, office provides comprehensive services in international law, health care, immigration, manufacturing, real estate, and non-profits. The collective strength of our practices — combined with our company’s exceptional reputation — has attracted a formidable pool of talented certified translators with specialized industry knowledge. In fact, most of our translators hold Master’s degrees in the industries they serve, including law, telecommunications, information technology and immigration, marketing, finance and public and environmental affairs. For additional information regarding our translation services expertise, please visit our website where you will find a myriad of information pertaining to all areas of service. Receive prompt service, excellent pricing, accurate translations and confidential document handling by contacting us for a free, no obligation proposal today.